No more spawn attackers inside settlement during settlement attacks. After fast travel or not. Cleaned masters on compatibility patch with "All Settlements Extended"
Added compatibility patch with "Build High - Expanded Settlements"
- You need your settlements to be a true safe harbor? You want the attack spawn mechanics work the way they should? Install AGOMBz! Attackers, Get Off My Buildzone, it's all in the name. Big walls deserve respect. Enjoy, make settlements great again and please endorse AGOMBz. ??? What is the difference between Settlement Attacks Beyond and Attackers - Get Off My Buildzone? 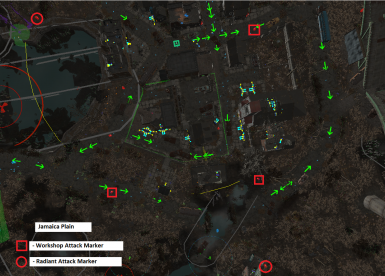 Mod moves attack markers beyond the boundaries of settlements? Mod solves the problem with spawning enemies inside a settlement after fast travel? 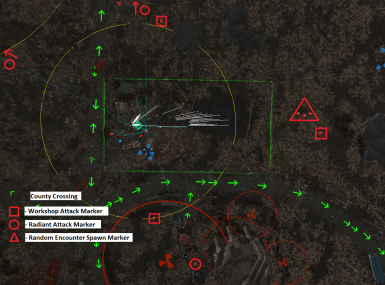 Mod unlinks attack markers from fast travel mat? NPCs can warp over obstacles, especially if the player is further away. But attacks begin OUTSIDE the boundaries of your settlement. Synths can teleport. No teleporting when the player has never been to The Institute, OR The Institute is destroyed. This mod edits WorkshopXAttack quests. Settlement Attacks Beyond - checked v.1.1 - Incompatible + Uninstall required! Settlement Attacks Beyond - Nuka World - checked v.1.0 - Incompatible + Uninstall required! Thanks to GroteGrottrol for testing, mod name, and touching up the description page.